Introduction: For decades, the diagnosis of diabetes mellitus was based on blood glucose criteria, either the fasting blood glucose (FBG) or a 2-h value in the 75-g oral glucose tolerance test. In 2009, an International Expert Committee that included representatives of the American Diabetes Association (ADA), International Diabetes Federation and European Association for the Study of Diabetes recommended the use of the HbA1c test to diagnose diabetes with a threshold of ≥6.5% and this criterion was finally adopted by ADA in 2010. Hence, the study was undertaken to evaluate the predictive efficacy of glycated hemoglobin as a diagnostic tool for diabetes mellitus and to identify individuals at risk of developing diabetes mellitus using Indian Diabetes Risk Score (IDRS). Materials and Methods: This cross-sectional study was conducted on the staff members of the Maharishi Markandeshwar Institute of Medical Science and Research, Mullana, Ambala, Haryana, India. Out of the total 800 staff members, 200 staff members were included in the study (88 faculty members, 37 staff nurses, 12 laboratory technicians, 25 clerical staff, 38 class IV) selected by systemic random sampling. Every fifth member on the list was included in the sample. After obtaining the data, it was coded and analyzed using multivariate logistic regression analysis. 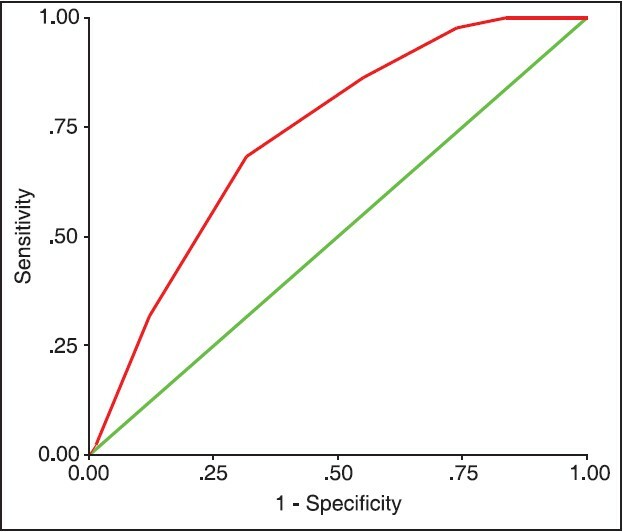 Receiver operating characteristics curve analysis was used to predict the sensitivity, specificity, positivity, negativity and overall accuracy of a diagnostic test. A two-tailed test P < 0.05 was considered as statistically significant. Data was analyzed using SPSS 20 (IBM, Chicago, USA). Results: Out of 200 subjects, 19.5% were labeled diabetic using FBG, 23% by postprandial blood glucose (PPBG) and 38.5% by using glycated hemoglobin according to ADA guidelines. A total of 62% had high-risk score out of which majority belonged to group-I (faculty) followed by group-II (nursing staff) and group-IV (clerical staff). With the advancement of age in each gender, IDRS also increased significantly. FBG, PPBG and glycated hemoglobin had sensitivity of 51.1%, 50%, 82.2%; specificity of 89.6%, 89.7%, 74.8%; positive predictive value of 58.9%, 48.8%, 48.6%; and negative predictive value of 86.3%, 85.8%, 93.5%, respectively. FBG and PPBG were better correlated with glycated hemoglobin in males when compared to females. Correlation coefficient between FBG and glycated hemoglobin was stronger than PPBG and glycated hemoglobin. IDRS value ≥60 had optimum sensitivity of 65% and specificity 62.5% for determining diabetes. Conclusion: Combination of FBG and glycated hemoglobin as biochemical parameters for diagnosing diabetes mellitus was better when compared to FBG and PPBG so both can be taken as screening/diagnosing parameters. Glycated hemoglobin may be a useful measure for diagnosing diabetes and supports a possible cut-off point ≥6.5% that is in line with current recommendations. According to revised ADA guidelines, people with HbA1c levels in the range of 5.7-6.4% are "at very high risk" for developing diabetes mellitus over 5 years. Henceforth, the range of 5.5-6.0% is the appropriate level to initiate preventive measures. Hence, the study was undertaken to evaluate the predictive efficacy of glycated hemoglobin as a diagnostic tool for diabetes mellitus and to identify individuals at risk of developing diabetes mellitus using Indian Diabetes Risk Score (IDRS). This cross-sectional study was conducted in the Department of Biochemistry among the staff members, Maharishi Markandeshwar Institute of Medical Science and Research, Mullana, Ambala, Haryana, India. Out of the total 800 staff members above the age 30, 200 staff members were included and selected by systemic random sampling. A list of all employees was prepared, and every fifth name on the list was included in the study as a sample. The first group consisted of 88 faculty members. Group-II included 37 staff nurses and group-III-12 laboratory technicians. Group-IV included 25 members of clerical staff and in group-V were 38 class IV employees. The present study was approved by the Ethical Committee of the hospital and was conducted after obtaining informed and written consent from the participants. Two questionnaires were used to find out the presence of diabetes mellitus; first was a self-designed, pretested questionnaire, which included personal details, risk factor details, anthropometric evaluation, laboratory investigations and the second was proforma for IDRS. Two milliliters of venous blood sample were taken after 8 h of fasting as per the standard guidelines and protocol, under all aseptic precautions. Glucose oxidase-peroxidase method was used for the estimation of FBG and 2 h postprandial blood glucose (PPBG)  and HbA1c was estimated by taking blood sample in an ethylenediamine tetraacetic acid vial and was estimated by modified Ion-exchange high-performance liquid chromatography  these all were analyzed on automated chemistry analyzer Metrolab 2300 (Made in Argentina). For the statistical data analysis, descriptive statistics was used to calculate the frequency of the study population. Pearson correlation coefficient was calculated between variables where data was approximately normally distributed. Pearson Chi-square test/Fisher exact test (whatever was applicable) have been used to assess the association between attributes. To determine the risk factors (odds ratio/adjusted odds ratio) associated with disease, univariate logistic regression analyses were carried out while, for multinomial independent variables, multivariate logistic regression analysis have been used. Receiver operator characteristics curve (ROC) analysis was used to predict the sensitivity, specificity, positivity, negativity and overall accuracy of a diagnostic test. A two-tailed test P < 0.05 was considered as statistically significant. Data were analyzed using SPSS 20 (IBM, Chicago, USA). Out of 200 subjects, 92 (46%) were males and 108 (54%) females with a mean age of 43.67 ± 10.42 years. Mean levels of FBG, PPBG and HbA1c were 105.15 ± 35.35 mg/dL, 166.94 ± 49.93 mg/dL and 6.25% ± 1.16%, respectively. 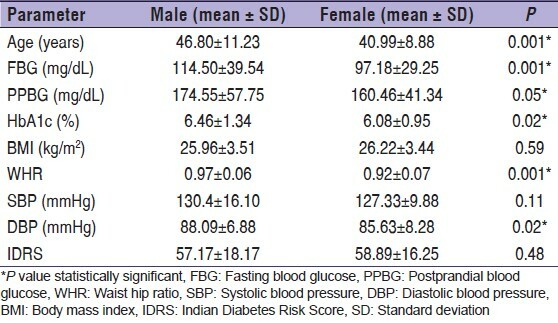 Mean levels of different clinical parameters like body mass index (BMI), waist-hip ratio (WHR), systolic blood pressure, diastolic blood pressure and IDRS were 26.10 ± 3.47 kg/m 2 , 0.95 ± 0.07, 128.75 ± 13.17 mmHg, 86.76 ± 7.75 mmHg and 58.10 ± 17.14 score, respectively [Table 1]. Nineteen percent (19.5%) were labeled diabetic using FBG, 23% by PPBG and 38.5% by using HbA1c, according to ADA guidelines. A total of 62% had high-risk score out of which majority belonged to group-I (faculty) followed by group-II (nursing staff) and IV (clerical staff). With the advancement of age in each gender, IDRS also increased significantly [Table 2]. [Table 3] shows a significant increase in FBG, PPBG and HbA1c levels in males as compared to females. A nonsignificant BMI increase in females, whereas a significant increase of WHR in males as compared to females was observed. A nonsignificant increase in IDRS (P = 0.48) was seen in females [Table 3]. 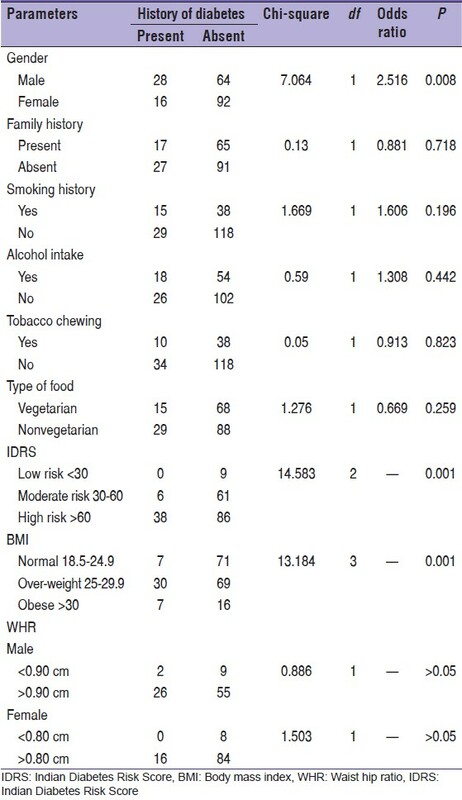 BMI and IDRS were statistically significant when compared with diabetic history [Table 4]. Taking both the biochemical parameters (FBG and PPBG) into consideration, 63.65% was diagnosed to be nondiabetic, 66.6% were prediabetic and 82.1% were diabetic. Significant association was seen between FBG and PPBG (P < 0.001) [Table 5]. Similarly, while taking HbA1c and PPBG together into consideration 84.1% were nondiabetic, 57.3% were prediabetic and 46% were diabetic. [Table 6] showed a significant association between HbA1c and PBG (P < 0.001). In addition, using HbA1c and FBG, 51% of study subjects were nondiabetic, 41.2% were prediabetic and 87.2% had diabetes. A significant association between FBG and HbA1c was seen (P < 0.001) as shown in [Table 7]. FBG, PPBG and HbA1c had sensitivity of 51.1%, 50%, 82.2%; specificity of 89.6%, 89.7%, 74.8%; positive predictive value (PPV) of 58.9%, 48.8%, 48.6%; and negative predictive value (NPV) of 86.3%, 85.8%, 93.5% respectively. HbA1c was hence having a highest sensitivity and NPV, while PPBG and FBG with higher specificity compared to HbA1c [Table 8]. [Table 9] showed a stronger correlation coefficient between FBG and HbA1c than PPBG and HBA1c. IDRS value ≥60 had optimum sensitivity of 65% and specificity 62.5% for determining diabetes. Mostafa et al. while comparing the diagnostic indices of HbA1c in undiagnosed type 2 diabetes mellitus patients reported PPV of 44.8% and NPV of 98.9% at cut-off value of HbA1c ≥6.5% in white Europeans (similar to our results) compared to PPV of 36.2%, NPV of 98.8% sensitivity of 78.9% (similar to our results) and specificity of 92.8% among South Asians. A similar NPV value for HbA1c was also reported in other studies also. , Ramachandran et al. reported a specificity of 87% and sensitivity of only 51% for HbA1c (cut-off value of ≥6.5%) as a diagnostic tool for diagnosing type 2 diabetes mellitus in Indian patients. However, Lipscombe, reported a very high specificity (99%) and low sensitivity (30%) of HbA1c (cut-off value of ≥6.5%) in American patients. The reason for differences our study and others may be due to different ethnic groups are found to have different sensitivity and specificity values for HbA1c, which may be related to genetic differences in the concentration of hemoglobin, the rates of glycation and the lifespan or count of red blood cells. Recently, racial and ethnic variations in HbA1c have been reported to impact the potential utility of HbA1c test. Partly, the differences in results may be due to the different assay methods employed as mentioned by Herman et al. 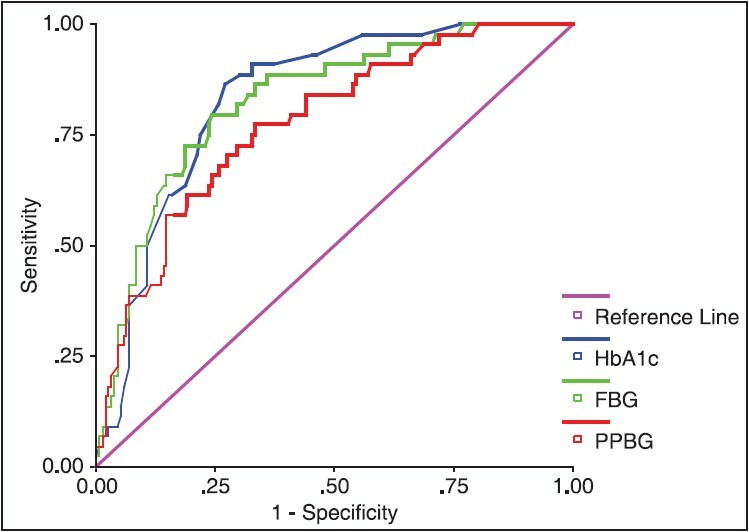 Thus, from our study, HbA1c was found to have the highest sensitivity for detecting diabetic cases as compared to FBG or PPBG though with slightly lower specificity. Also, a significantly high NPV was seen for HbA1c among all tests. A sensitivity (65%) and specificity (62.5%) of IDRS value ≥60 were obtained for HbA1c as evidenced from area under ROC curve which was highest for HbA1c than for FBG and PPBG [Figure 2]. These results were similar to those reported by Mohan et al. and Adhikari et al. , ROC curve was obtained for IDRS and tested for diabetics showing AUC of 0.731 with P < 0.001, CI = 95%, SE = 0.039 [Figure 3]. The present study showed that both FBG and PPBG correlated significantly with HbA1c values. Avignon et al. reported a better correlation between HbA1c and PPBG,  similar to that of our study where HbA1c and PPBG showed a good correlation and linear relation using linear regression analyzer. Same results were observed by Rosediani et al. Bastyr et al. also reported similar findings with stronger correlation of 2-h PPBG (r = 0.400, P < 0.001) than FBG (r = 0.260, P = 0.004). A study carried out by Soonthornpun et al. also concluded that strong correlation with HbA1C value was seen with 2-h postprandial plasma glucose (r = 0.51) for near normal FPG (FPG <7.8 mmollL). The correlation coefficient between FBG and HbA1c is stronger than the correlation coefficient between PPBG and HbA1c. Same results were found by Saiedullah et al. 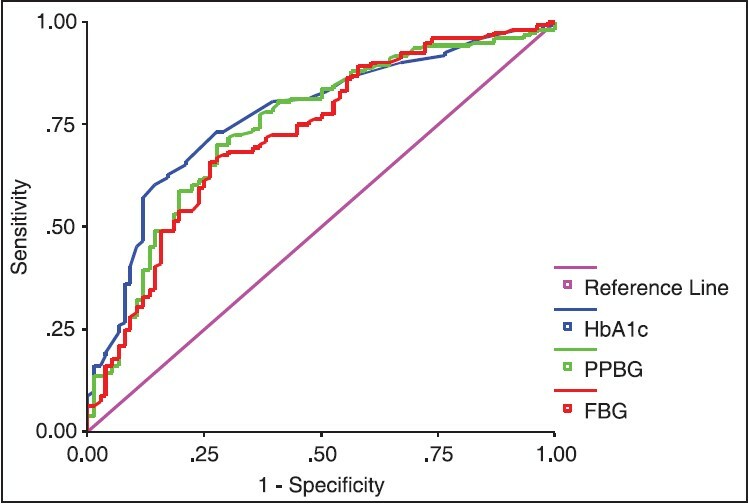 who found a better correlation between HbA1c and FBG than with PPBG. These results suggest that both FBG and PPBG correlated significantly with HbA1c. The combination of FBG and HbA1c as biochemical parameters for diagnosing diabetes mellitus is better as compared to FBG and PPBG so can be taken as screening/diagnosing parameters. HbA1c may be a useful measure for diagnosing diabetes and supports a possible cut-off point ≥6.5% that is in line with current recommendations. Comparison of National Diabetes Control Program of India by utilizing IDRS versus ADA guidelines provides a broader perspective of applicability of ADA guidelines in Indian setup. Within this study, we found that the impact of utilizing HbA1c ≥6.5% as the preferred diagnostic tool detected significant number of diabetic patients as compared when using FBG or PPBG. Thus, it can be concluded that at least the people with diabetes would not be missed should HbA1c become the preferred diagnostic tool. The authors express gratitude to the all participants in this study for their patience and support. Also, the research funding provided by Indian Council of Medical Research (ICMR) to Dr. Qazi Najeeb is gratefully acknowledged. Fowler MJ. Microvascular and macrovascular complications of diabetes. Clin Diabetes 2008;26:77-82. Burtis CA, Ashwood ER. Tietz Textbook of Clinical Chemistry. 3 rd ed. New Delhi: W.B. Saunders Company (Indian edition); 1999. p. 790-1. Sicree R, Shaw J, Zimmet P. The global burden. Diabetes and impaired glucose tolerance. Baker IDI Heart and Diabetes Institute, 2010. American Diabetes Association. Standards of medical care in diabetes - 2012. Diabetes Care 2012;35 Suppl 1:S11-63. Bao Y, Ma X, Li H, Zhou M, Hu C, Wu H, et al. Glycated haemoglobin A1c for diagnosing diabetes in Chinese population: Cross sectional epidemiological survey. BMJ 2010;340:c2249. Nathan DM, Turgeon H, Regan S. Relationship between glycated haemoglobin levels and mean glucose levels over time. Diabetologia 2007;50:2239-44. Trinder P. Determination of glucose in blood using glucose oxidase with an alternative oxygen acceptor. Ann Clin Biochem 1969;6:24-7. Bissé E, Abraham EC. New less temperature-sensitive microchromatographic method for the separation and quantitation of glycosylated hemoglobins using a non-cyanide buffer system. J Chromatogr 1985;344:81-91. Nowicka P, Santoro N, Liu H, Lartaud D, Shaw MM, Goldberg R, et al. Utility of hemoglobin A(1c) for diagnosing prediabetes and diabetes in obese children and adolescents. Diabetes Care 2011;34:1306-11. Is fasting glucose sufficient to define diabetes? Epidemiological data from 20 European studies. The DECODE-study group. European Diabetes Epidemiology Group. Diabetes Epidemiology: Collaborative analysis of Diagnostic Criteria in Europe. Diabetologia 1999;42:647-54. Rosediani M, Azidah AK, Mafauzy M. Correlation between fasting plasma glucose, post prandial glucose and glycated haemoglobin and fructosamine. Med J Malaysia 2006;61:67-71. Takahashi K, Uchiyama H, Yanagisawa S, Kamae I. The logistic regression and ROC analysis of group-based screening for predicting diabetes incidence in four years. Kobe J Med Sci 2006;52:171-80. Perry RC, Shankar RR, Fineberg N, McGill J, Baron AD, Early Diabetes Intervention Program (EDIP). HbA1c measurement improves the detection of type 2 diabetes in high-risk individuals with nondiagnostic levels of fasting plasma glucose: The Early Diabetes Intervention Program (EDIP). Diabetes Care 2001;24:465-71. Dzebisashvili T. P2-392 Risk factors for diabetes and prediabetes. J Epidemiol Community Health 2011;65:A330-1. Available from: http://jech.bmj.com/content/65/Suppl_1/A330.4. Abstract. doi:10.1136/jech.2011.142976l.22. Kim KS, Kim SK, Lee YK, Park SW, Cho YW. Diagnostic value of glycated haemoglobin HbA(1c) for the early detection of diabetes in high-risk subjects. Diabet Med 2008;25:997-1000. Mostafa SA, Khunti K, Kilpatrick ES, Webb D, Srinivasan BT, Gray LJ, et al. Diagnostic performance of using one-or two-HbA1c cut-point strategies to detect undiagnosed type 2 diabetes and impaired glucose regulation within a multi-ethnic population. Diab Vasc Dis Res 2013;10:84-92. Kumar PR, Bhansali A, Ravikiran M, Bhansali S, Dutta P, Thakur JS, et al. Utility of glycated hemoglobin in diagnosing type 2 diabetes mellitus: A community-based study. J Clin Endocrinol Metab 2010;95:2832-5. Mohan V, Vijayachandrika V, Gokulakrishnan K, Anjana RM, Ganesan A, Weber MB, et al. 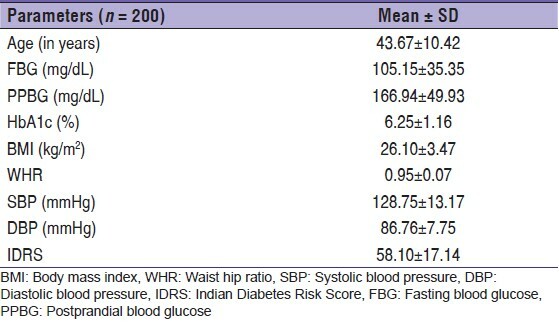 A1C cut points to define various glucose intolerance groups in Asian Indians. Diabetes Care 2010;33:515-9. Ramachandran A, Snehalatha C, Samith Shetty A, Nanditha A. Predictive value of HbA1c for incident diabetes among subjects with impaired glucose tolerance - Analysis of the Indian Diabetes Prevention Programmes. Diabet Med 2012;29:94-8. Lipscombe L. ACP Journal Club. HbA1c levels had low sensitivity but high specificity for screening for diabetes. Ann Intern Med 2011;154:JC4-9. Bennett CM, Guo M, Dharmage SC. HbA(1c) as a screening tool for detection of Type 2 diabetes: A systematic review. Diabet Med 2007;24:333-43. Herman WH, Cohen RM. Racial and ethnic differences in the relationship between HbA1c and blood glucose: Implications for the diagnosis of diabetes. J Clin Endocrinol Metab 2012;97:1067-72. Herman WH, Ma Y, Uwaifo G, Haffner S, Kahn SE, Horton ES, et al. Differences in A1C by race and ethnicity among patients with impaired glucose tolerance in the diabetes prevention program. Diabetes Care 2007;30:2453-7. Avignon A, Radauceanu A, Monnier L. Nonfasting plasma glucose is a better marker of diabetic control than fasting plasma glucose in type 2 diabetes. Diabetes Care 1997;20:1822-6. Bastyr EJ 3 rd , Stuart CA, Brodows RG, Schwartz S, Graf CJ, Zagar A, et al. Therapy focused on lowering postprandial glucose, not fasting glucose, may be superior for lowering HbA1c. IOEZ Study Group. Diabetes Care 2000;23:1236-41. Soonthornpun S, Rattarasarn C, Leelawattana R, Setasuban W. Postprandial plasma glucose: A good index of glycemic control in type 2 diabetic patients having near-normal fasting glucose levels. Diabetes Res Clin Pract 1999;46:23-7. Saiedullah M, Begum S, Shermin S, Rahman MR, Khan MAH. Relationship of glycosylated hemoglobin with fasting and postprandial plasma glucose in non-diabetic, pre-diabetic and newly diagnosed diabetic subjects. Bangladesh Med J 2011;40:37-8.